This is an excellent double crust cherry pie. My dad said it was the best he’d ever eaten in his life, but he admitted he’d never had one made with fresh cherries so we have to take that into consideration. 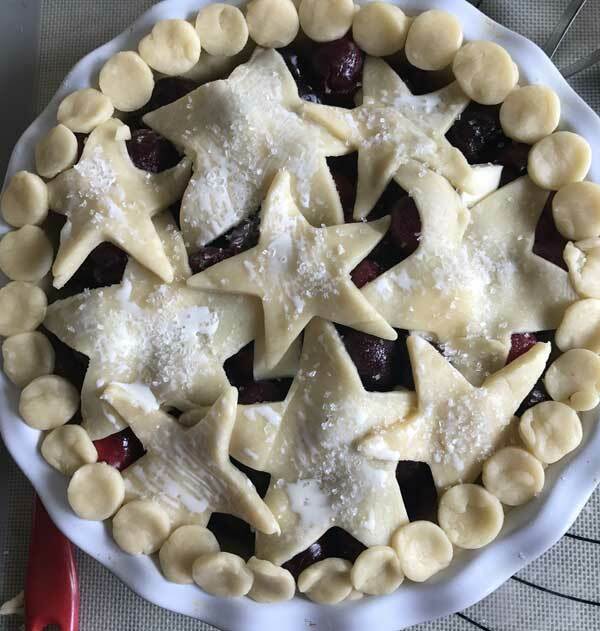 Canned or frozen cherries work in this pie, but if you have the time to pit 2 pounds of fresh cherries, your efforts will be appreciated. Trust me. This recipe is pretty basic, but if you have fresh cherries no one will think so. If you have fresh sour cherries, I’m jealous. 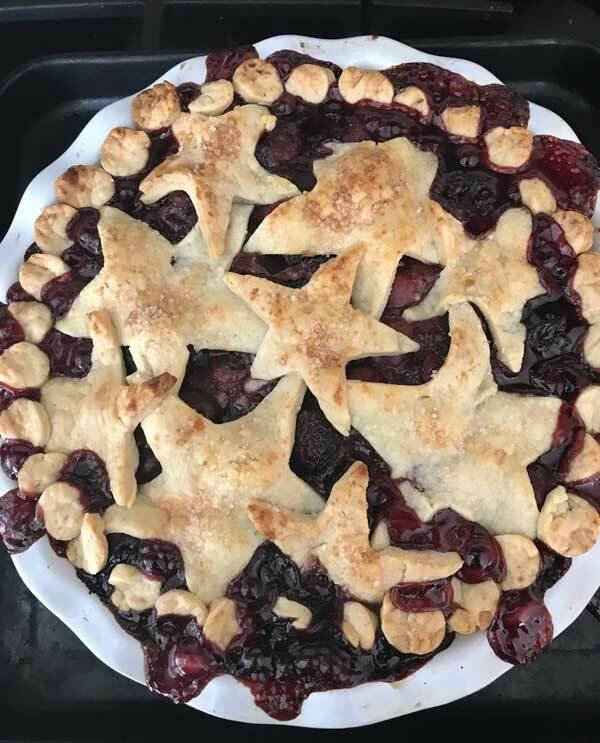 But since that’s something I’ll never find in December in Texas, I went ahead and made it with sweet dark cherries and they were just perfect. This is based on an Epicurious recipe which is going to be my go-to cherry pie. Also, sorry I keep calling things “go-to” but I like that term. Preheat oven to 425 degrees F. Put a heavy duty rimmed baking sheet in the oven so that it heats with the oven. Stir sugar, cornstarch, and salt in a mixing bowl to blend. Stir in cherries. Stir lemon juice, almond extract and vanilla extract together. Pour over cherry mixture and stir to mix. Transfer to pie shell and dot with the bits of butter. Roll out half the dough and press into a 9 inch deep dish pie plate (I use glass). Put cherry filling inside. Roll out second half of dough and cut out strips. Arrange a lattice of strips across top of pie. Brush strips lightly with milk and sprinkle with sugar. Place pie on the preheated rimmed baking sheet and bake 15 minutes at 425 F.
Reduce oven temperature to 375°F. Bake pie until filling is bubbling and crust is golden brown, covering edges with foil collar if browning too quickly, about 1 hour longer. Trader Joes sells fantastic sour morello cherries in large jars. Well, I have cherries in my freezer frozen from last spring’s crop. I may just have to try this for Christmas day. cherry pie is my favorite pie in the world!!! this looks amazing. 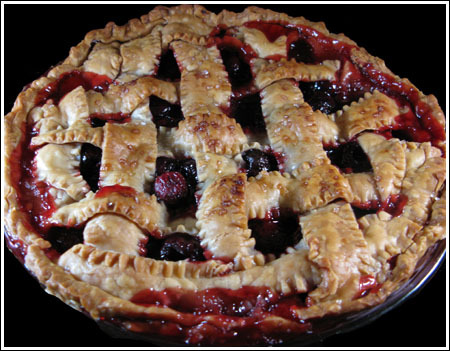 i remember there was a pie contest on the food network and the winning pie was cherry. i’ve always wanted to make her recipe to see if it really is the best pie in america. I had this last night, and I can report back that this was fantastic. My husband absolutely, positively adores cherry pie. Fresh sour cherries are such a treat, and so difficult to come by. I”m glad your pie was such a success! Ohhhh, cherry pie. One of my favorites! That looks wonderful! Thanks!!! Cherry is one of my favortie pies and was always my dad’s favorite. I’ve never made one that, shhh, wasn’t from a can (love that stuff), but someday really need to try the real thing. Great lattice job, I’m never good at that.